Professor Christine Zuni Cruz and Honor Keeler (`10) made presentations at Repatriation at 20: A Gathering on Native Self-Determination and Human Rights, a two-day symposium at the Sandra Day O’Connor College of Law at Arizona State University. Keeler was the only law student invited to participate in the late January symposium. Zuni Cruz and Keeler were members of a panel titled, The Future of Native Repatriation Policy: Native Self-Determination and Human Rights in the 21st Century. Zuni Cruz discussed the recognition of traditional indigenous law as the foundation for protection of indigenous peoples’ human rights to the ethical treatment of their dead, and as a critical element to their self-determination in the repatriation process. 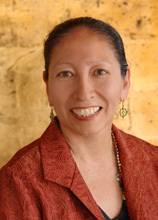 Her scholarship and teaching focuses on the law of indigenous peoples. Keeler, a member of the Cherokee Tribe, spoke about international repatriation and her work in that area, both in the Southwest Indian Law Clinic and previously with Sen. Jeff Bingaman’s office. Kevin Gover (`81 ), director of the National Museum of the American Indian, was a keynote speaker and Walter Echo-Hawk (`73), of counsel with Crowe & Dunlevy, moderated discussions.